Meghan will be blogging for espnW throughout her training leading up to the Olympics in London this summer. She delivers this installment from the U.S. Olympic Training Center in Chula Vista, Calif.
Time warp. These two words pretty much describe training at the USOTC in San Diego. I've been here for almost four months, and I've lost all sense of time. 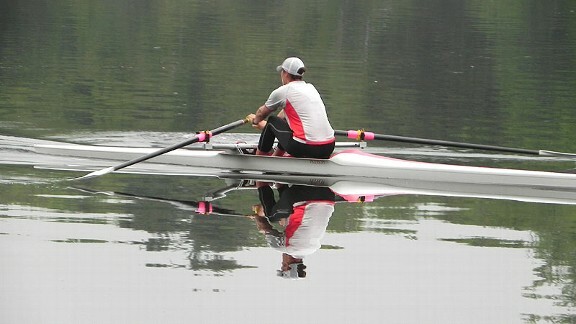 Days blend together, filled with a repetitive -- but critical -- regimen of rowing, eating, rowing, eating again, resting and spending time in PT (physical therapy) ... then rowing and eating some more. Endurance sports like rowing demand an unbelievable amount of time to get in the volume of work it takes to be successful. With only a handful of "off" days in a span of 12 weeks, Mondays are no different than Fridays, and weekends simply don't exist. Somewhere between the training and meals, I manage to get some work done and take care of tasks like buying groceries and paying the bills, but it's tough to pack everything in. April 15 is just around the corner, and I've gotta get on my taxes -- stat. In the midst of exhausting, long days, we manage to find ways to break the monotony and take our minds off the stress. A small group of us have formed Film Club, which is really just a fancy way to say we've been making great use of 2008 Olympian Megan Kalmoe's Netflix membership. From "Moneyball," to "Pride and Prejudice," to a "Twilight" movie marathon (yes, all four movies) and "Beauty and the Beast," we're not at all discriminating in our choices. We've also been channeling our competitive spirits toward Words with Friends (basically, Scrabble on Facebook) and DrawSomething (very similar to Pictionary). When we don't have our fingers wrapped around our oars, they're usually holding our iPhones. Crossword-puzzle craziness has completely infected the team. Breakfast is often spent shoveling food as well as finding "a five-letter word that means ..." There are two camps here: those who collaborate and those who compete. I'm definitely a collaborator. Each of these help us catch a break and have some fun in the rare and precious downtime we're given. Honestly, without DrawSomething and Netflix, this USOTC time warp might drive us nuts! Get more on Meghan's rise from rookie to Olympic hopeful in her last blog entry.